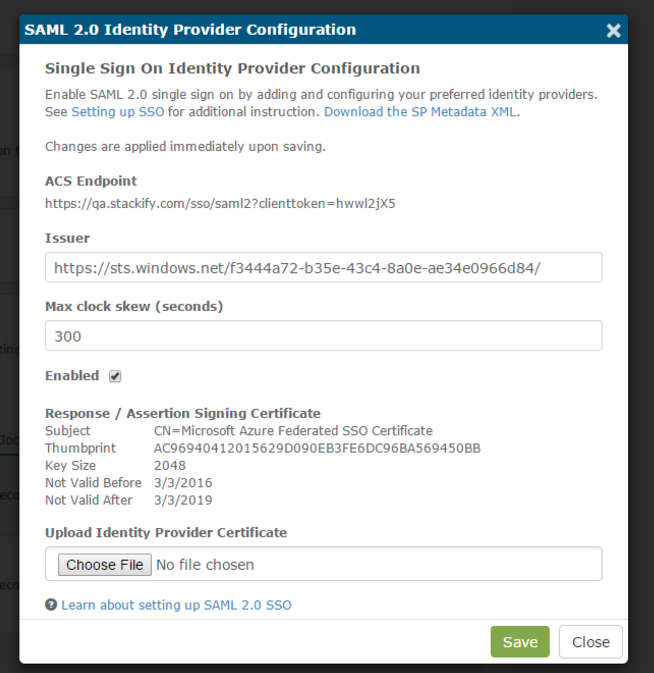 The SAML assertion Subject > NameId element must have an email address in the SAML OASIS Email Format specification. That email address must match a registered user in Stackify with that email address. To keep things simple, we have provided a client user interface allowing a client to setup their own Single Sign-on (SSO) configuration. To access these settings open the menu item Settings and navigate to Account. Single Sign On configuration is located at the bottom of this page. The user must be authorized to manage users and roles in order to see this section. Users may choose to "Add Identity Provider" (IdP) or Edit an existing. When adding a new identity provider, the user must provide just an Issuer name and the Identity Provider's public key certificate used to sign the response and/or assertion(s). The Stackify SSO identity provider configuration allows for a client to adjust the max clock skew setting which is used to tune in expiration validation in case server times between the Identity Provider (IdP) or Service Provider (SP) are out of sync. After successfully authorizing any number of SSO providers in your Retrace account, you'll be able to see the provider details at the bottom of the Account page. The right columns on of the table will let you know if the provider is active, and also let you edit the providers credentials. Stackify will supply the client with a public key certificate which we recommend is used to encrypt the assertions within a SAML response; however, this encryption is not required. 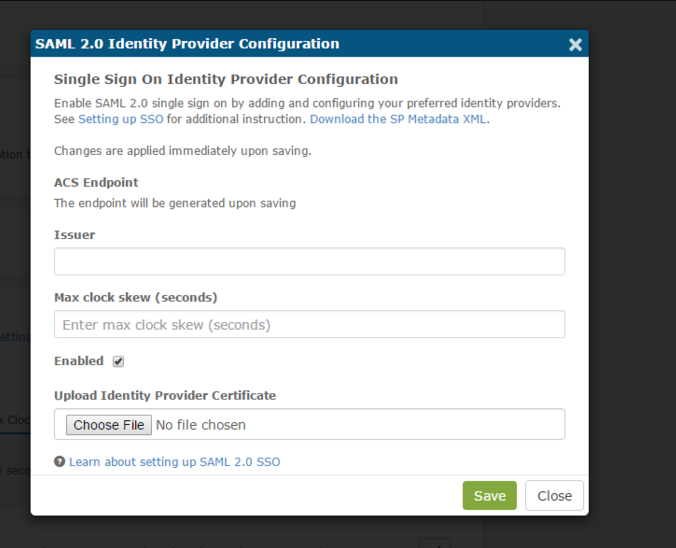 You can download the Service Provider's metadata XML file via the Download the SP Metadata XML link in the SAML 2.0 Identity Provider Configuration modal. If you need help setting up Single Sign-on functionality or have feedback about it, please don't hesitate to contact the support team: [email protected].